WASHINGTON — President Donald Trump on Monday called Democrats' stone-faced reaction to his State of the Union address last week "treasonous" and "un-American" during a visit to a manufacturing plant in Cincinnati. Trump described Republicans as "going totally crazy wild" during his remarks last Tuesday, while expression-less Democrats remained seated for the majority of the speech. "They were like death," Trump lamented. "And un-American. Un-American." But their reaction, he said, was also something much worse. Here's why not: "treason" doesn't mean "doesn't seem to love the U.S.A." It doesn't even mean "is highly critical of the President." How big a deal is this? Only nine people have ever been convicted of treason against the U.S.A., and the last person to be convicted was Tomoya Kawakita in 1952, who allegedly abused American prisoners in Japan during World War II. ...Hogan Gidley, a White House spokesperson, told NBC News Tuesday morning that Trump was being "tongue in cheek" when he accused the Democrats of “treason." The president, Gidley said, was simply trying to make the point that there are positive things going on that all Americans should celebrate regardless of their party. No, the stammering "I mean, yeah, I guess. Why not?" pretty clearly showed that Trump has no idea what "treason" means. Even categorizing a failure to "celebrate regardless of their party" as "Un-American" is dangerous and unfunny. Trump is a fascist. 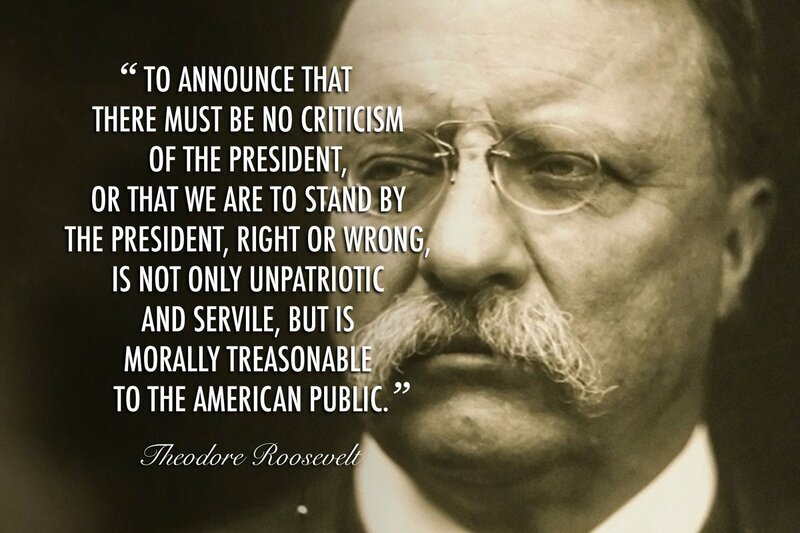 From his perspective, even after swearing to uphold the constitution, being critical of him is treason. He sees himself as the state. All the people he has fired due to the investigation didn't take an oath to be loyal to the president but to uphold the constitution. Almost every one of them is a Republican and some of those who are under fire were Trump picks or appointments. Attacks on the media too are right out of the fascist playbook. Scapegoating (other) is right out of the fascist playbook. Personally, I think Trump is too stupid to know he's a fascist. But he is. It's the people who defend him that blows my mind because many of them know better, or should. They are way more dangerous to our democracy than Trump is because they will let it happen for the sake of some short term goal. We should absolutely be critical of everyone and everything, including the President. Perhaps, especially the President. But lately, there have been groups and ideas coming from the left who cannot stand criticism and lash out with ad hominem attacks at the slightest opposition. But lately, there have been groups and ideas coming from the left who cannot stand criticism and lash out with ad hominem attacks at the slightest opposition. Can you please be more speciffic? Which groups, and what kind of criticism? Don’t forget: He came down from on high to save us. His judgements and pronouncements are always just and righteous. Even when others may scoff at His unquestionable wisdom, we know that His ultimate plan will lead to what is best for us, even if it may appear otherwise. We know that we are right because evildoers oppose us and our Master. We know that they are evil because He tells us so,and those who accuse Him of wrongdoing or error are in league with evil. We must be faithful and obedient regardless of the circumstances, or of whatever trials we endure to test our faith. As He establishes His holy kingdom, His enemies will fall and all will bow to His splendid majesty. Ahem! Am I the only one noticing the overlapping narratives? Trump is what a wise man looks like to a fool. Wouldn't that be - a fool is what a wise man looks like to Trump? I am very concerned that Trump is not totally in control of our government. If you read some of the book "Fear" by Bob Woodward you will see that even during the campaign he was devoid of any rational problem solving ability. When you have seasoned four star generals bailing on your, who have served with honor, and would have died for our country, you have to start questioning if something bad is going to happen. If you look at recent news there is some scary military maneuvering going on by Iran, Russia, and China. I have never had chills when reading the news but I did recently when I saw that they are all moving military assets closer to the U.S. Welcome to the SFN, piquant! I am very concerned that Trump is not totally in control of our government. Trump isn't even totally in control of himself. But seriously, Trump should not be totally in control of anything but the Executive Branch of our government. But even then, it's so massive that lots of it has to run without direct supervision of the President. A good leader delegates, defers to experts, and trusts that the people way down in the hierarchy can do their jobs competently. Trump, so far as I can tell, does none of this. Sure, the front-line clerks in immigration offices aren't taking daily direction from Trump himself, but that's because he's ignorant of them, not because he trusts them (and also because they're currently furloughed). I have never had chills when reading the news but I did recently when I saw that they are all moving military assets closer to the U.S.
To be fair, geographically, China really can't move military assets anyplace without moving them closer to the U.S. However, there's been a really long dispute about who "owns" the waters around China, and the U.S. military has regularly sent warships through the South China Sea as purposefully provocative moves to challenge China's territorial claims. The U.S. has military assets everywhere, so it's a little neurotic to expect America's foes to make no threatening moves in return.